Traditionally Grown Hampshire Watercress (Nasturtium officianale) is green and noted for its distinctive peppery, mustard-like flavour. It is recognised as a food with high nutritional value, and is packed full of nutrients and vitamins some of which include vitamin C, folic acid, iron, vitamin A and calcium. It is probably best known for its traditional use as a classic ingredient for soup. 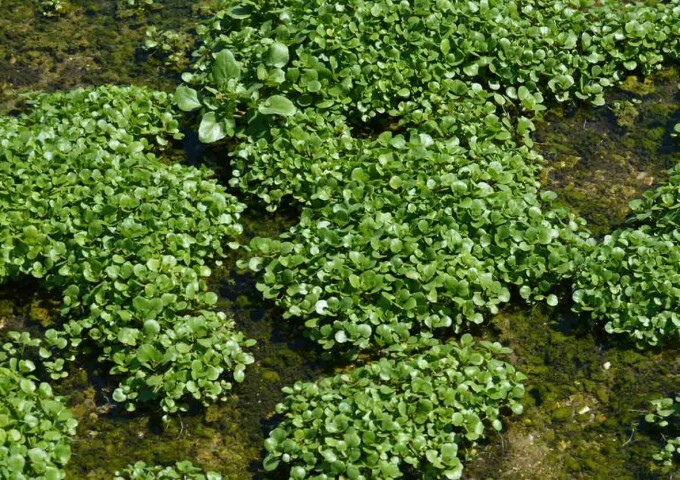 Watercress is a semi-aquatic plant, the stems are hollow allowing water to travel upwards to nourish the leaves. The water from which the cress derives its name is introduced to the plants gently at first and then in ever increasing volumes as the plants grow. The water reaches a maximum depth of two inches, with a mature bed needing up to 20,000 gallons of water per acre per hour. The water is only ‘borrowed’ as once its work is done, it is allowed to flow back towards the river. Watercress will, contrary to popular belief, grow anywhere that is moist, although a clean source of running water is argued to produce better crops. The period of April and May is believed to be the best time to collect the crop, although Watercress can be gathered at anytime that the ground is not frozen. As watercress is highly perishable, a high degree of care is required in modern cultivation and skilled hands are needed in harvesting, packing, and shipping. Watercress, an indigenous plant known for its food value since Roman times, was a crop introduced to commercial cultivation in England in 1808. The Georgian town of Arlesford became the centre of the watercress industry in 1865 when the railway line, the ‘Watercress Line’, to London opened. In the 1800’s watercress sandwiches were a staple part of the working class diet in Hampshire and Dorset, partly because it could be picked free from rivers and streams where it grew wild. Watercress was in great demand due to the perceived health benefits and this lead to commercial Watercress farms establishing themselves throughout Hampshire. During the 1960’s the ‘Watercress’ railway line was closed meaning that transport via road was the only option. By the 1980’s 90% of growers had left the industry. The acreage of watercress declined during the 20th century as demand and price became stagnant and costs increased. More recently mechanisation has been introduced and has become the common method except for a handful of traditional growers. There have also been attempts to move away from traditional growing methods and grow watercress in soil rather than waterbeds. This Product has been supported by Graysons Restaurants, who are key sponsors of the Ark of Taste within the UK.